How And Where To Buy Serc Online? You can buy Serc online through our Canadian International Pharmacy at huge savings. We offer RX and OTC medications online with a valid prescription from your doctor. At Canadian Pharmacy World, your health is our priority. You can place the order online, by mail, by fax or toll-free over the telephone at 1866-485-7979. Are There Alternative Names For The Brand And Generic Serc? The brand Serc comes from Turkey and Canada also called Betaserc manufactured by Abbott. 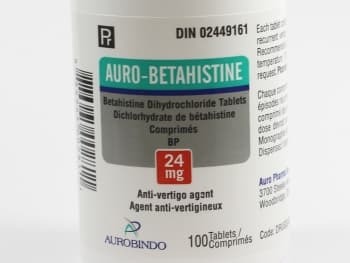 The generic equivalent of Serc is Betahistine and it comes from Canada also called Auro-betahistine manufactured by Aurobindo. We also carry the generic Betahistine from India also called Vertin and from United Kingdom manufactured by different manufacturers. What Dosages And Forms Is Serc Available In? The branded as well as generic form of Serc is available in the dosage forms of 8 mg, 16 mg and 24 mg dosage forms as tablets. What Is Serc Used For? Serc is a histamine equivalent which is used to decrease the recurrent episodes of vertigo (dizziness) associated with Ménière’s disease (a disorder of the inner ear). To know more about this disease, you can visit here. This drug is also used to treat symptoms of ringing in ears, hearing loss that accompanies vertigo in Ménière’s disease. In Ménière’s disease, vertigo is caused due to build-up of pressure in the ear. The active ingredient in Serc is betahistine dihydrochloride reduces the pressure build-up in the ears. This is carried out in two ways: by increasing the histamine turnover and release, and by increasing the blood flow in the inner ear. Thus, build-up of pressure in the ears is prevented, hence reducing the episodes of vertigo. What Are The Possible Side Effects Of Serc? Some of the common side effects that can occur after taking Serc are stomach pain, nausea, vomiting, indigestion, bloating, headache, rashes on skin and itching. After Serc was introduced in the market, some people also experienced drowsiness, light-headedness, fainting, and heart palpitations because of a decrease in blood pressure. It is not clear yet, whether these side effects occurred from Serc use or other unconnected factors. In case any of the above mentioned side effects affect you in a severe way, contact your health care professional right away. These are not all the side effects that can occur while taking Serc. If you experience any other unexpected effects, immediately contact your doctor. Are there any Precautions and Drug interactions for Serc? Serc most likely does not affect the ability to use and drive tools and machinery. However, Ménière’s disease itself can make you feel dizzy and affect your ability to drive and use machines. You should not drive machinery or operate tools if you are experiencing these symptoms. •	Are allergic to betahistine dihydrochloride or any other non-medicinal ingredients in the tablet. Serc is not recommended for use in children below 6 years of age. If you see a different doctor, inform him or her that you are using Serc. You should always tell your health care professional about any medications that you have been taking or are going to take including prescription and non-prescription drugs, vitamins and herbal supplements. •	Anti-histamines, which may lessen the effects of Serc. Serc may lessen the effects of anti-histamines. •	Monoamine oxidase inhibitors (MOAIs) used to treat depression or Parkinson’s disease. These drugs might increase the amount of Serc in blood and your doctor might need to change the dosage of Serc. The drug should be stored at a room temperature of 15°C to 30°C in a tightly closed container, protected from moisture. It should be kept out of the reach and sight of children.